A burglary occurs every 14.5 seconds in the United States - and the average 911 response time has climbed to 10 minutes due to federal budget cuts. With the SABRE Home Series Door and Window Alarm Kit you can fortify your home against property crime. 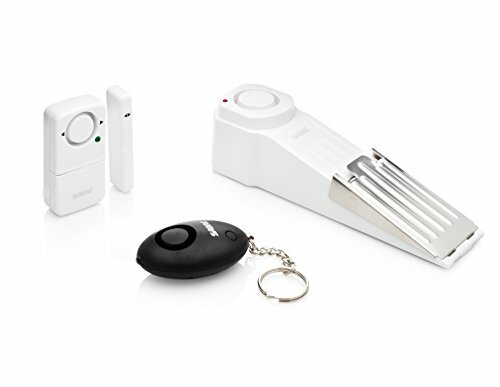 Now available in a four-pack for a greater value, the attention-grabbing Door and Window Alarm Kit offers an attention-grabbing120 dB alarms audible up to 750 feet (230 m) away. Kit comes with a main Door Alarm with key pad and 3 Window Alarms. Door and window alarms work independently from each other. 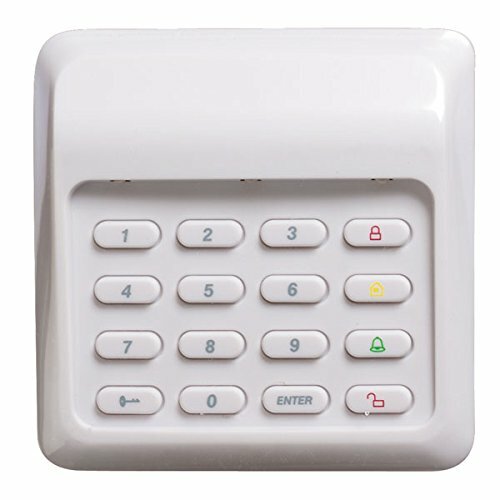 The door alarm key pad prevents accidental activation by a 4-digit PIN of your choosing with entry/exit delay setting; no key fob required The alarm kit now comes with the away mode and new, no-delay “Home Mode” feature which immediately alerts those inside the home of a potential intruders. There’s no entry alarm delay, warding off any potential threats. The Door and Window Alarm Kit works during power outages – 4xLR44 batteries are included for a greater value. Installation is a breeze, with no wiring required. For an added level of security, the alarm features a low battery test button. The Door and Window Alarm was developed by SABRE, the #1 pepper spray brand trusted by police and consumers worldwide, meaning this product is extremely reliable. Backed by 40 years in the security industry, SABRE products are ISO 9001:2008 certified and must pass rigorous quality assurance testing before leaving our facilities to give you peace of mind. Improve your home security today. A burglary occurs every 14.5 seconds in the U.S., and budget cuts have led to an average 911 response time of 10 minutes. Help protect your vehicles and other expensive equipment with the 120 dB Shed/Garage Alarm, which is audible up to 750 feet (230 m) away. This versatile security alarm is armed via a keypad and includes entry/exit delays to prevent false triggering. The consumer preferred, premium white security alarm looks great inside your home! With no wiring needed, the alarm installs in minutes and works during power outages. The Shed/Garage Alarm requires 3xAAA batteries (not included). The Shed/Garage Alarm was developed by SABRE, the #1 pepper spray brand trusted by police and consumers worldwide, meaning this product is extremely reliable. Backed by 40 years in the security industry, SABRE products are ISO 9001:2008 certified and must pass rigorous quality assurance testing before leaving our facilities to give you peace of mind. Improve your home security today. A burglary occurs every 14.5 seconds in the United States - and the average 911 response time has climbed to 10 minutes due to federal budget cuts. With SABRE&rsquo;s Dorm/Apartment Kit you can fortify your hotel room, dorm or home against property crime. The Door Stop Alarm features a non-skid pad to prevent door from opening while sounding a 120dB alarm, which is audible up to 750 feet (230M) away. This security alarm is battery operated and works during power outages (requires 1x9V battery, not included). The 120dB Door/Window Alarm is audible up to 750 feet (230M) away. Installation is extremely easy and takes just seconds, as the sensor can be placed on either side of the alarm. The chime setting is perfect for keeping track of children and visitors while you&rsquo;re at home. Requires 4xLR44 batteries (included). At 110 dB, the Mini Personal Alarm with LED Light calls for help up to 500 feet (150M) away. The keychain attachment helps ensure your security alarm is readily available, while the LED flashlight helps you quickly locate door locks in the dark. Requires 3xLR44 batteries (included). The Dorm/Apartment Kit was developed by SABRE, the #1 pepper spray brand trusted by police and consumers worldwide, meaning this product is extremely reliable. Backed by 40 years in the security industry, SABRE products are ISO 9001:2008 certified and must pass rigorous quality assurance testing before leaving our facilities to give you peace of mind. A burglary occurs every 14.5 seconds in the U.S., and budget cuts have led to an average 911 response time of 10 minutes. Better manage your home’s security by adding a second keypad to your existing WP-100 Wireless Home Alarm System. 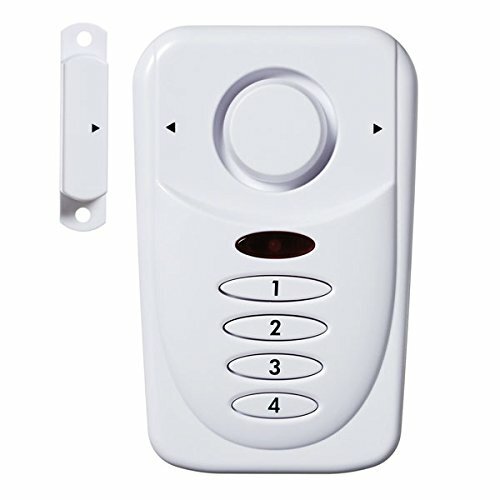 Perfect for your back door, garage or master bedroom, the keypad will allow you to manage and test the system as well as use the panic feature for emergency situations. There’s no wiring needed, so the keypad installs easily and works during power outages. The 2xCR2032 battery is included, providing a greater value. 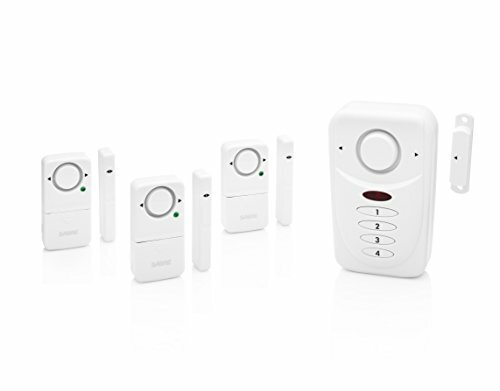 The Wireless Keypad Control and all components of the Wireless Home Alarm System were developed by SABRE, the #1 pepper spray brand trusted by police and consumers worldwide, meaning this product is extremely reliable. Backed by 40 years in the security industry, SABRE products are ISO 9001:2008 certified and must pass rigorous quality assurance testing before leaving our facilities to give you peace of mind. Improve your home security today.